In 1801, a genial and brilliant Revolutionary War veteran and politician became the fourth chief justice of the United States. He would hold the post for 34 years (still a record), expounding the Constitution he loved. Before he joined the Supreme Court, it was the weakling of the federal government, lacking in dignity and clout. After he died, it could never be ignored again. Through three decades of dramatic cases involving businessmen, scoundrels, Native Americans, and slaves, Marshall defended the federal government against unruly states, established the Supreme Court's right to rebuke Congress or the president, and unleashed the power of American commerce. For better and for worse, he made the Supreme Court a pillar of American life. 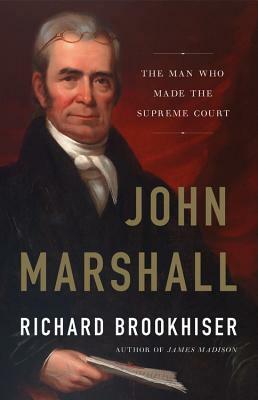 In John Marshall, award-winning biographer Richard Brookhiser vividly chronicles America's greatest judge and the world he made. Richard Brookhiser is a senior editor of National Review and the author of twelve books, including Founder's Son: A Life of Abraham Lincoln; Alexander Hamilton; American; and Founding Father: Rediscovering George Washington. He lives in New York City.